A significant number of autoimmune diseases (examples include, arthritis, lupus, celiac and cancer) are food-induced. This discovery, which has been known since the 1970s, verifies the fact that certain foods can trigger an immune reaction and an auto-immune process, whereby the immune system begins to attack itself. In this scenario, gluten is a major culprit food for many people – not just Celiac sufferers. Today, one can hardly investigate health topics without discovering gluten-free recommendations as the solution to many conditions. What some people and doctors may not fully understand yet is that gluten is only one of the thousands of proteins found in wheat, barley, rye, etc., and is found in ALL grains. This discovery warrants serious investigation, especially if you’ve gone ‘gluten-free’ and still feel sick; there’s no such thing as a gluten-free grain. Gliadin is the main type of gluten found in wheat, and is the only gluten protein that is currently measured in mainstream medicine. What about the other gluten proteins? Some researchers have shown there are forty glutens more toxic than gliadin for gluten-sensitive people. Because conventional lab tests only measure anti-gliadin antibodies, others may be wreaking havoc in our bodies even though lab tests come back negative for gluten sensitivity..
Gluten allergy, sensitivity, intolerance or Celiac? There are 4 gluten-related designations: Gluten allergy denotes an allergy to gluten and produces a typical allergic response. Gluten intolerance is the inability to digest gluten, and gluten sensitivity is a combination of allergy and intolerance. Celiac is an autoimmune disease produced from the damage created by gluten in susceptible individuals (those genetically predisposed to gluten sensitivity). In gluten-sensitive individuals, gluten creates a ‘perfect storm’ set of conditions leading to intestinal flora imbalance, leaky gut and eventually a myriad of vitamin and mineral deficiencies if not corrected. 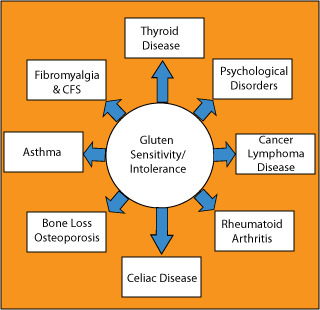 Hence, gluten is ultimately responsible for many more diseases than Celiac (see diagram). For example, there are 20 types of cancer associated with vitamin D deficiency, and the most common deficiencies seen in gluten-sensitive individuals are vitamin B12 and iron. Now that we know gluten is in every grain on the planet (found in the endosperm), is it enough for gluten sensitives to stop eating wheat only? I think the answer is no, and gluten sensitive individuals that want to avoid these diseases must be clear on this. Unfortunately, corn and rice pose the same problems for gluten sensitives, and should be avoided as well. In addition, foods labeled ‘gluten-free’ at the supermarket are only refering to gluten from wheat. Be informed.